What can you do on the coast when it’s cold outside? As it turns out, plenty. You’ll discover lots of indoor attractions along Alabama’s Coastal Connection. The Estuarium at Dauphin Island Sea Lab is a wonderful place to spend the day with the family. Kids love the stingray touch pool and the dozens of aquariums that house a variety of fish, turtles, snakes and more. Winter hours are 9-5 Monday through Saturday and 1-5 on Sundays. Admission fees range from $6 to $11; children under 5 are admitted free. For those interested in history, the Gulf Shores Museum and Orange Beach Indian & Sea Museum make excellent stops. 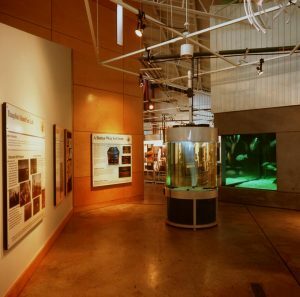 Both museums offer free admission to peruse exhibits and artifacts from these community’s earliest days as fishing villages. Up the road in Foley, railroad enthusiasts will enjoy the Foley Railroad Museum and Model Train Exhibit. The model train rattles along the tracks on Tuesdays, Thursdays and Saturdays from 10 a.m. to 2 p.m. This display is also free, and is manned by volunteers just as enthusiastic about the trains as their visitors. Across the street is the Holmes Medical Museum, open Monday-Saturday 10 a.m.-2 p.m. This free museum displays original medical artifacts, including surgical instruments, operating room machinery and a human skeleton. The interior of the museum is practically unchanged from the time it served as Baldwin County’s first hospital, from 1936-1958. Don’t miss the Fairhope Museum of History, a fun stop for the whole family. Exhibits depict early life in Fairhope, including the ferry wharf, which served as the community’s lifeline. Housed in the original city hall, it also includes the jail, where kids will enjoy the Mayberry-esque jail cells and police equipment. There’s plenty to keep you busy on the Alabama coast, no matter the weather.